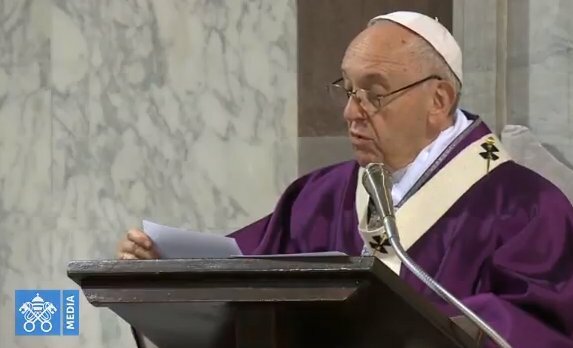 This afternoon –Ash Wednesday, day of the beginning of Lent – an assembly of prayer took place in the form of the Roman “Stations,” presided over by Pope Francis. At 4:30 pm, in the church of Saint Anselm all”Aventino, a moment of prayer was held followed by a penitential procession to the Basilica of Saint Sabina. Taking part in the procession were Cardinals, Archbishops, Bishops, Benedictine monks of Saint Anselm, Dominican Fathers of Saint Sabina and some faithful. At the end of the procession, Pope Francis presided over the celebration of the Eucharist in the Basilica of Saint Sabina, with the rite of the blessing and imposition of ashes. The following is a translation of the homily that the Pope delivered after the proclamation of the Holy Gospel.